My dad is a smart man. He grows amazing gardens, can fix anything, build anything, understands plumbing, electrical stuff, mechanical stuff.. He understands the stock market, he reads books - way beyond his meagre education. He's the kind of guy you want for a neighbour/landlord. At 80, he still shovels half the block and mows endless lawns. He completely renovated a bathroom, by himself in less than two weeks and finished it last week. He built the cabinets, retiled.. all the while working his part-time job at a local funeral home, volunteering, going to church.. and so on. I'm exhausted just thinking about all the things he does. He's simply amazing. Everyone he meets loves him and thinks him the perfect gentlemen. Just this week, he has relented and asked to learn how to use a computer. He wants to "learn how to finger it".. ye gads. So I've set him up with two typing programs, Mom is there to turn it on at the moment.. She's a wiz, trust me. She books all the vacations, on the internet, books the cars, hotels - they just returned from Mexico and she leaves for Ireland in a few days. Anywho.. The problem is, as lovely as my dad is, he's a lousy student. He's a turtle. Slow and steady wins the race and all that.. With mom leaving for the next couple of weeks. Dad's going to alone and I can't be there to teach him at his pace. The long and the short of it is, I'm looking for a program or software, a self tutorial that caters to the elderly. Something that understands slow fingers and the need to teach the double click, cut and paste, how to access the internet in simple, simple steps. If anyone has any ideas I'd love to hear them. I've been looking but I'm not finding what I need. Sometimes the best way is just to find a few web sites that he enjoys and then let him immerse himself and let the need to move around the links be its own training method. Once he's clicking and reading, maybe the rest will just come to him slowly. 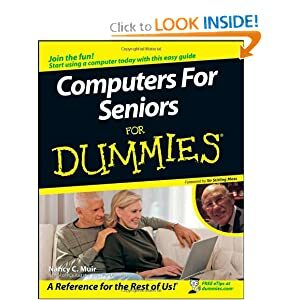 Have him call my father, who actually teaches computers to fellow seniors. They're on their own for call volume, though. This is actually a great point. Both of my parents are extremely tech-averse but they both have iPads and are finally "getting it" in a way they haven't, well, ever. When my 80-year-old father saw I had a computer, he wanted to give it a try. I suggested he play some card games. He would get the hang of the cursor and clicking on things. "I can play cards?" We had to drag him away from the computer. Dad's great but he's cheap. He's got a laptop and that's pushing the envelope. There'll be no Ipad. He doesn't play cards or games, and I have the dummies book, but that won't help him learn to finger... as it were. Thanks. I appreciate the help, but it's not what I need. it's nice thing to teach compute to our grand parents.really Nice!